The World Peace and Unification Sanctuary in Newfoundland, Wayne County held a blessing ceremony that included AR-15s. We have an inside look at Wednesday's service. 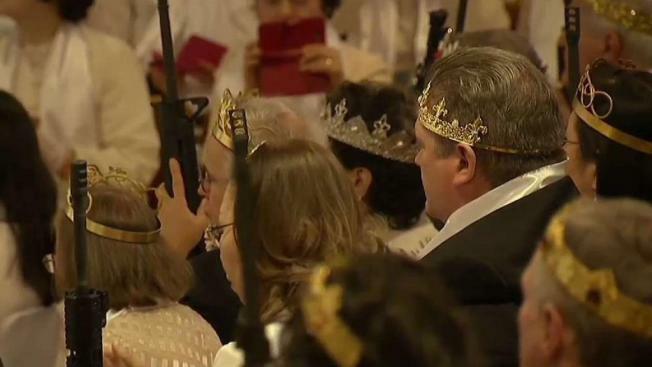 Worshippers in a Pennsylvania church clutching AR-15 rifles drank holy wine and exchanged wedding vows in a commitment ceremony Wednesday morning. The event at the World Peace and Unification Sanctuary in Newfoundland, Wayne County, led a nearby school to cancel classes. The Rev. Sean Moon leads the controversial church. He and his wife are known as the king and queen. Moon said in a prayer Wednesday that God gave people the right to bear arms. He held a gold AR-15 rifle throughout the ceremony. Moon is the son of the Rev. Sun Myung Moon, a self-proclaimed messiah who founded the Unification Church, often described as a cult, in the 1950s. 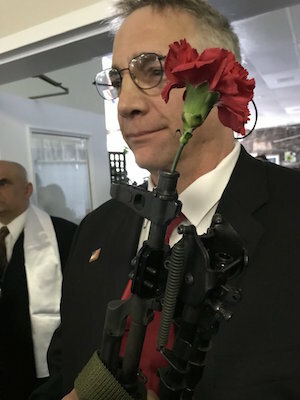 The sanctuary believes the AR-15 symbolizes the "rod of iron" in the book of Revelation, and encouraged couples to bring the weapons to the ceremony. An AR-15 was used in the Florida high school massacre. Women wearing white wedding-style dresses and men in black suits calmly shuffled into the building. Church officials said all weapons would be unloaded, secured with zip ties and checked at the door. At least one man placed a red rose in the barrel of his gun. 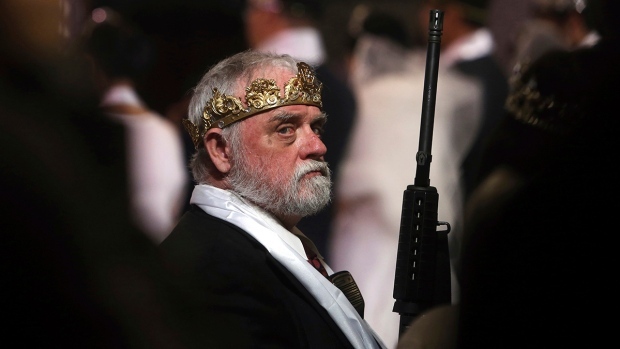 Churchgoer clutches his gun during prayers at the World of Peace and Unification Sanctuary. Inside the building, paintings featured guns with the word "Holy" written above each one. Several quoted the Bible: “Blessed be the lord, my strength, which teacheth my hands to war and my fingers to fight." Once seated, attendees were invited to bring out their guns, muzzles up, and keep their fingers off the trigger. The ceremony, held about a half-mile from Wallenpaupack South Elementary School in the Pocono Mountains, was expected to draw hundreds of couples. Protesters also gathered early Wednesday morning. Some worried about safety while others disapproved of guns inside a church. One man told NBC10 he was outraged at the display and wanted to see it stopped. "I don't care about guns," local resident Bill Duff said. "I care about people." On Friday, the superintendent of the Wallenpaupack Area School District wrote in a letter to parents that while "there is no direct threat to our school or community," given concerns about parking, traffic and the "nature of the event," students will be bused to schools about 15 miles (24 kilometers) away. The Sanctuary church, which also calls itself Rod of Iron Ministries, is a breakaway faction of the Unification Church. The Southern Poverty Law Center, which tracks hate groups across the country, has called Hyung Jin Moon an "anti-LGBT cult leader." Moon's father was most notable for holding mass weddings and his followers were dubbed "Moonies." Church officials said it planned Wednesday's event months ago, well before the Feb. 14 massacre at a Florida high school. Authorities say the gunman there used an AR-15 in an attack that killed 17. The Unification Church distanced itself from Wednesday's event, saying its ceremonies and theology do not involve weapons. "It saddens us that Reverand Moon's son has chosen to separate himself and walk in opposition to his parent's legacy building world peace," the Rev. Richard Buessing, president of Family Federation, another name for the Unification Church, said in a statement.